Successfully Added 3TB Home Cloud Storage - High Speed Transfer, USB 3.0, WiFi Connection, App Remote Access, Backup Features to your Shopping Cart. Own your own cloud and always have access to your files. With the SSK SSM-F100 home cloud, you’ll have all the storage available to securely save all your media and files. It provides you with a whopping 3.5-Inch 3TB of memory. With all this memory at hand, you’ll have enough space to store over 600.000 pictures. This means that, even if you capture a hundred pictures per day for the coming 16 years, you still won't run out of storage space. From now on, you’ll never again have to worry about where to save your family pictures, holiday videos, and other types of media. 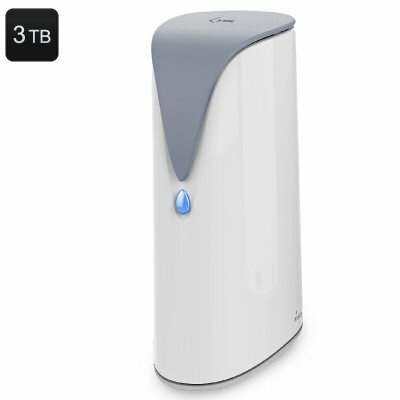 This home cloud supports high-speed transfer rates meaning that all your files are securely stored away in the blink of an eye. With its built-in dual-antennas, this home cloud can be easily connected to your wireless router. Thanks to this, you’ll always be able to access your personal files no matter where you’re at. This makes your cloud extremely useful to share media with friends and family abroad. Additionally, it provides you with a way to always access your favorite movies, series, or photographs. Whether you’re at home, in the office, or traveling abroad – from now on you’ll always have access to your own personal files. Your home cloud supports iOS, Android, Windows, MAC, and Linux operating systems. So no matter your device, you’ll always be able to make use of its cloud services. The SSK SSM-F100 can also be accessed remotely via your iOS or Android smartphone through the dedicated mobile App. You’ll be able to easily manage all your data and to make back-ups with the switch of a button. Like this, you can be assured that your files will never get lost. If you are looking for a way to store all your personal files and to share them with friends and family across the globe, this electronic gadget is perfect for you. This home cloud comes with a 12 months warranty, brought to you by the leader in electronic devices as well as wholesale electronic gadgets..